By default, both settings will enable when selecting "Add To Scheduled Order". Note: Some stores have unique fulfillment integration needs and will selectively disable one of the settings for a product. Contact us if you have a unique fulfillment or marketing integration that should leverage this unique setting. Autoship Cloud adds a robust set of options for pricing and scheduling products for future Autoship orders. Note: It's not required to enable all of the options to simply enable products for Autoship using the Default Frequencies and Bulk Update features of Autoship Cloud. 1. Enable Schedule Options: Toggles whether or not Autoship options will be displayed to customers on the product page. 2. Autoship Checkout Price: The price that will be charged at checkout if an Autoship frequency is attached to the product at cart/checkout (this is a "one-time" checkout price for Autoship and does not sync to the Autoship Cloud Product). 3. Autoship Recurring Price: The price that will be charged for the product on recurring orders created by Autoship Cloud (this price updates the "Sale Price" of the Autoship Cloud Product. Not entering a price for Recurring or clearing the Autoship Recurring Price means that the Regular price of the product will be used for recurring orders). * Autoship Checkout Price and Autoship Recurring price are independent, and either can be left blank (however, if both are left blank, you are effectively not offering any incentive for Autoship). 4. Frequency Options: Override Defaults: Toggles whether or not this product should display it's own frequency options. 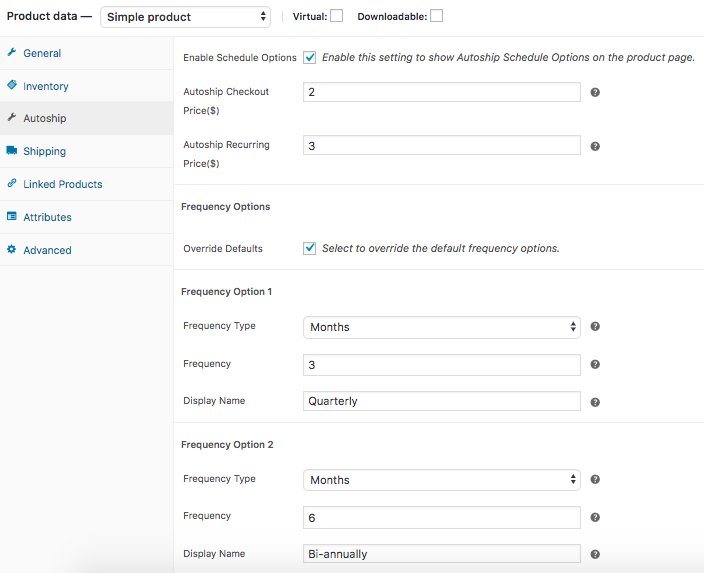 For example: if no frequency options are set for products enabled for Autoship, then the default frequency options (1,2,3 and 4 months) will display. 5. 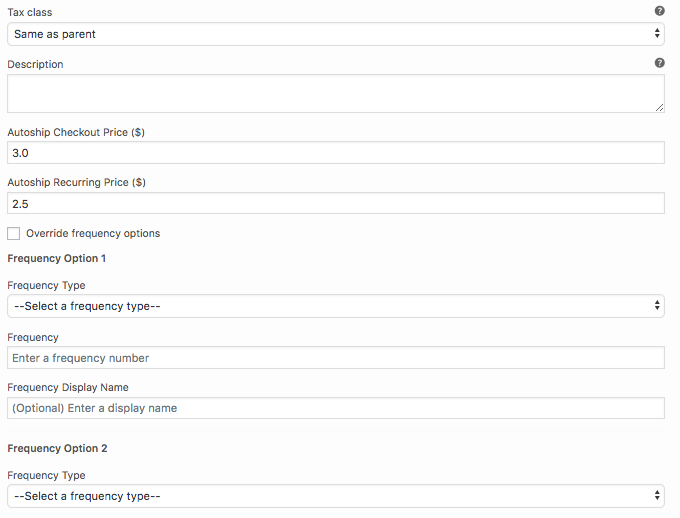 Custom Frequency Options 1- 5: The custom frequencies to display if "Override Defaults" is checked. At least one must be filled in, and up to 5 can be filled in.